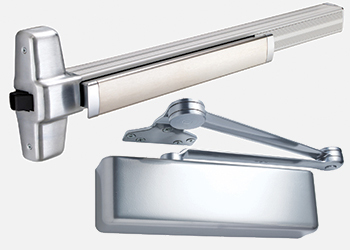 Allegion offers Von Duprin exit devices (left) and LCN door closers. 99-98_latch2.jpg Deadlocking latchbolt ... improved performance. In today’s changing environment, buildings and facilities need the highest levels of security and safety available provided by aesthetic and functional solutions that are highly durable and user-friendly, while also meeting stringent international standards. Allegion (formerly Ingersoll Rand Security Technologies) represented by Universal Building Materials Merchants Company (UBM) in Saudi Arabia is known for its continuous innovation, with brands that have established leadership positions in their respective markets, product segments and long-standing reputations for quality. 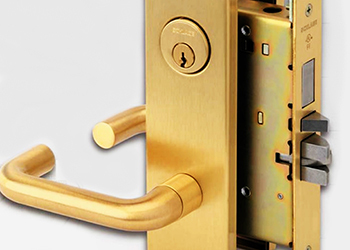 “Several Allegion brands such as Schlage (locks manufactured to American standards), Von Duprin (exit devices), LCN (door closers) and CISA (electrically controlled locks) have, over the years, created their own identity,” says a spokesman for the Riyadh-headquartered specialist in door hardware and mechanical products. 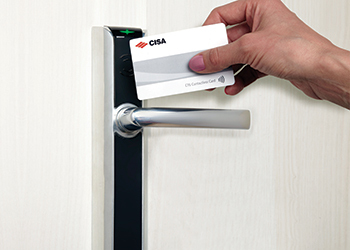 Electronic key cards ... from CISA. “These solutions are currently being used to reduce vandalism, theft, personal violence and terrorism and protect high-security areas in the world’s busiest airports, government buildings and nuclear power plants, universities, hospitals, corporate campuses, manufacturing facilities, multi-family dwellings and retail establishments,” he adds. A $2-billion company, Allegion produces a wide range of solutions and services for homes, businesses, schools and other institutions. Among such solutions are the Breakaway Lever Trim for exit devices from Von Duprin and Schlage locks with Vandlgard trims. “High-traffic, public-use buildings, such as schools, universities and healthcare facilities are exposed to high rates of use, abuse and, in some cases, vandalism. The Breakaway Lever Trim from Von Duprin and Schlage Vandlgard are the right products to ensure minimal damage to the hardware, while also lowering the maintenance cost of the facility,” the spokesman points out. The Von Duprin Breakaway Lever Trim for exit devices significantly reduces damage from vandalism and abuse while meeting ADA (American with Disabilities Act)-mandated standards. When unlocked, this trim will function as a standard lever trim. When locked, the lever feels locked until 35 pounds of force is applied to the lever, causing the lever to “break away” and travel 90 degrees down, appearing to be broken, he explains. Maintenance personnel can then reset the lever to the normal locked position. This “breakaway” feature prevents the lock mechanism from being damaged by excessive force. Schlage locks ... ensure high protection. Meanwhile, Schlage D-Series locks with Vandlgard trim provide maximum protection against damage and unauthorised entry. The exterior lever is designed to rotate freely while remaining securely locked. The freewheeling lever limits anyone’s ability to exert excessive force or to stand on the lever, preventing damage to internal lock components. “D-Series locks with Vandlgard trim are ideal for areas subject to abuse from students or anywhere vandalism is a likely threat. They are also available in a retrofit kit, permitting the school to utilise all or part of the existing Schlage hardware, therefore, reducing the cost of purchasing all new locks,” says the spokesman. Schlage locks ... manufactured to American standards. Among other products from Allegion are LCN door closers. The spokesman points out that a good door closer does not just close the door; it will also control the door in both the opening and closing cycles to prevent damage and injury caused by abuse, wind or other factors. LCN door closers do just that, he states. “LCN products can be found in many high-traffic facilities such as schools, hospitals, government buildings, and correctional facilities. With innovative door closure solutions, LCN products are trusted to work seamlessly during critical moments. With their high standards of performance, they provide customers peace of mind knowing their facilities are protected,” says the spokesman. LCN high-security door closers, which offer superior strength, durability and security, incorporate features that are essential elements in any security plan: heavy-duty, cast iron cylinders, Torx tamper-resistant screws, heavy-gauge steel covers with multiple attachment points, and arm joints that are pinned to prevent disassembly. Another factor to consider is hygiene and the prevention of spread of disease through door hardware in high-traffic buildings. 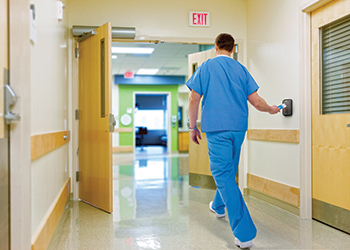 “High traffic buildings, such as healthcare facilities and educational organisations, are ideally suited to antimicrobial coated door hardware simply because they may have hundreds of people going in and out every day. Adding door hardware with an antimicrobial coating can make a big difference by inhibiting the growth of bacteria on hardware surfaces,” says the spokesman. He adds that all the aforementioned door hardware products are available with an optional antimicrobial clear coating, which is a durable BHMA (Builders Hardware Manufacturers Association)-compliant coating that provides long-lasting protection to the door hardware. Allegion offers a wide range of products that feature a silver ion antimicrobial coating. A choice of styles, functions and finishes ensures a solution that fits building use and design. Apart from investing time and money to produce hardware products that meet the functional and aesthetical requirements of a building, Allegion has also taken innovation to the next level by offering sound-reducing solutions for areas used for sleeping, wellness and recovery, and study and meeting rooms. The company offers a suite of products that provide customers with whisper-quiet latches and sound-reducing exit devices. The suite includes a collection of Von Duprin products comprising push pads, latches and exit devices. A fluid damper helps eliminate noise associated with exit device operations. • Quiet openings: Today, an increasing number of healthcare facilities are incorporating a patient-centred design that provides for a better experience and higher comfort. Studies have shown that noise inhibits healing time and increases patient frustration and dissatisfaction. 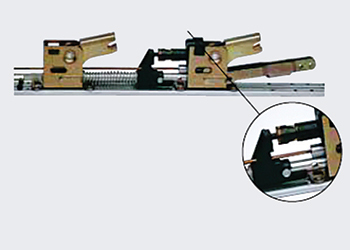 By incorporating exit devices with innovative dampers that decelerate the push pads’ motion and motor-driven electronic latches, most of the noise is eliminated. Also, using a concealed vertical cable system eliminates the rattle and clanking of rods in the door on the frame. • Secure environments: Hospitals have a greater need to prepare for emergencies. A comprehensive access control system improves security, minimises risk and provides a more complete and efficient way to track movement throughout the facility. In addition, with more caregivers relying on technology, the ability to eventually migrate to a smart card or mobile access credential will attract the attention of a more tech-savvy workforce. • Anti-ligature precautions: In hospitals, and particularly behavioural health facilities, protecting patients from harming themselves is a real concern. Specially designed anti-ligature devices help create a safer space for behavioural health patients. With unique sloped and recessed surfaces, these locks and hinges cannot be used as a ligature point for those intending to do harm to themselves. • Standardisation: Standardising solutions in a healthcare facility provide more control. It allows for more efficient installations and maintenance activities, better management of key systems and smoother performance of electronic access control and electrified door hardware. The American National Standards Institute (ANSI) and BHMA have developed durability, strength and performance standards for every type of door hardware on the market. To receive ANSI/BHMA certification, the products must undergo a series of rigorous operational and security tests to comply with the standards. Dozens of tests are performed on each product. Allegion products are sold in almost 130 countries, creating levels of security and cost-effective design to maximise access security and safety and minimise the construction, operation and maintenance of the total opening. UBM can support customers in the region in specifying the appropriate hardware for projects to ensure a quieter environment that fits the building’s needs and budget. Its team is well versed in local and national building codes, and can help specify customised solutions that are both aesthetically and functionally appropriate.